I have moved from the pasture to the townhouse, where the food is more abundant and delicious, the company more worldly, but ruder, and the cat more bold. I have returned like Prospero to Venice, like Orsino from Arcadia. I’ve left the greenwoods of Barnesdale for the cobbles of Nottingham, like Robin going to the party in disguise. 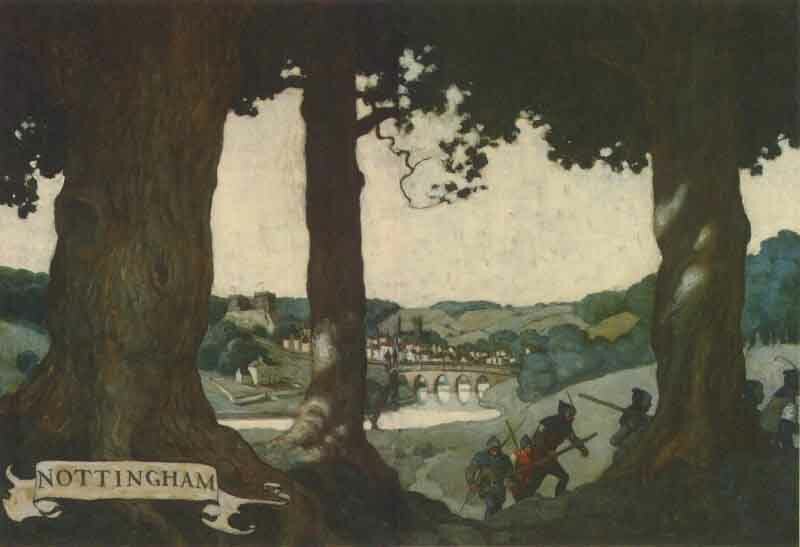 This is NC Wyeth’s classic endpaper illustration for the Paul Creswick Robin Hood of 1903, which is available in its entirety (except of course for shiny dustcover, lovely old-glue smell, cloth binding and old timey faux-cut pages) at Sacred Texts of all places–folklore passing into myth, myth into religion? This is Boston from Peter’s Hill, at the south end of the Arboretum. In the middleground is the conifers section, I think: larches from Europe, Douglas firs, even a couple of dawn redwoods from China, mixed in with our local hemlocks and pines. The availability of green space, to my surprise, is not all that much diminished. Instead of Mt. Sugarloaf, I’ve got the Arboretum. The Blue Hills replace the Holyoke Range. Instead of Mt. Toby, the Emerald Necklace. Of course, it’s all rather more well-traveled than I’m used to, and the forage isn’t nearly as good, what with all the groundwater being contaminated with oily city ick. But I’ll manage, I think. I don’t get nearly as many weird looks as I’d have expected for walking around town with a big stick. No more than I did in the Valley, anyhow.